Get ready to pack the dance floor, because here comes Sugar Free Allstars! 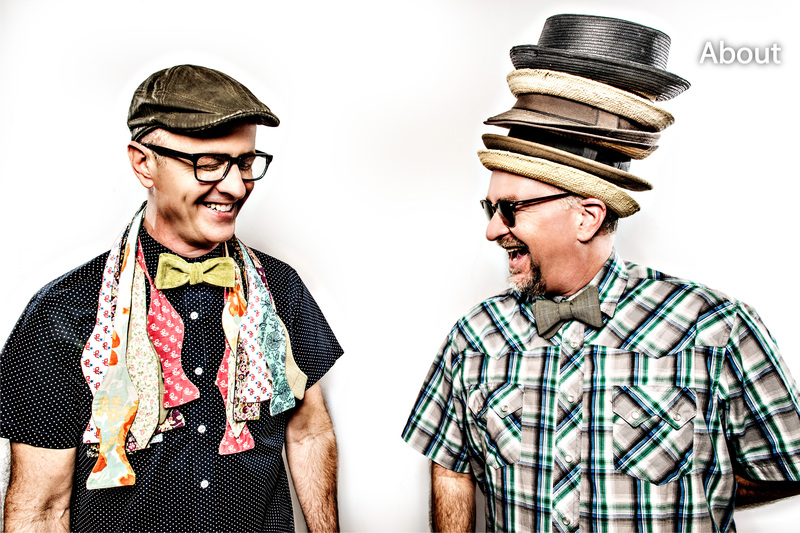 This Grammy-featured, family funk super duo from Oklahoma City has been listed as one of Time magazine’s top 12 family music acts in America. They blend elements of soul, rhythm & blues, disco, gospel and New Orleans street parade music to provide a high energy rock show dance party experience that has been described as a funky, foot-stompin’, hand-clappin’, body movin’ and groovin’ dance-until-you-drop party for all ages! Chris “Boom!” Wiser (lead vocals, keyboards, woodwinds) and Rob “Dr Rock” Martin (drums, backing vocals) first met as music majors at Southwestern Oklahoma State University where both were members of the school’s top jazz ensemble. Over the next several years they gained experience as bandmates in musical groups of varying styles but eventually parted ways. Though fate still had big plans for the dynamic duo and would bring them back together in 2001 where they re-joined forces as Sugar Free Allstars. They have since developed into the bowtie-clad two piece groove machine beloved by families across the country. Since their foray into the world of family music Sugar Free Allstars has garnered a great deal of critical acclaim and accolades on the national level. Among these are mentions in Time, People and Parents magazines, favorable reviews on About.com and Wired.com, numerous starred reviews in School Library Journal, multiple #1 hits on SiriusXM radio’s Kid’s Place Live, National Parenting Publication Awards (NAPPA) Gold Award, Parent’s Choice Silver Award, airplay on the #1 NPR show “Car Talk”, and inclusion of a song on the anti bullying compilation “All About Bullies Big and Small” which won the 2011 Grammy for Best Children’s Album. Their newest album (released on date April 2, 2016), self-titled Sugar Free Allstars, includes 11 original songs and a cover of “Can You Picture That” by Dr. Teeth and the Electric Mayhem, recorded for the 1979 Muppet Movie. Recorded at Bell Labs Recording Studio in Norman, Oklahoma and engineered and co-produced by former Chainsaw Kittens guitarist Trent Bell, the album was four years in the making and borrows heavily from the funk, rock and R&B sounds of the 1970s and ‘80s. Grown-up ears will hear the influence of Parliament Funkadelic, early ‘80s Prince, old-school rap, Deep Purple, Zeppelin, Dixieland and New Orleans Second Line. Guest artists on Sugar Free Allstars include Genevieve Goings on vocals (Choo Choo Soul); Roger Manning, Jr., on keyboards (member of Beck’s band since 1995 and founding member of Jellyfish and Moog Cookbook); and Fred Tackett on guitar (recorded and toured with Bob Dylan and a current member of Little Feat). This album, along with 2012’s All On A Sunday Afternoon, 2010’s Funky Fresh and Sugar Free and 2007’s Dos Ninos,continues to solidify Sugar Free Allstars’ place in the Kindie (indie music for kids) music scene as the purveyors of Family Funk. Veteran touring artists, Sugar Free Allstars have performed at festivals and venues all over the United States and Italy including Austin City Limits Festival, Wolf Trap Children’s Theatre-in-the-Woods and Rumpus Room at SiriusXM radio’s Kid’s Place Live studios, as well as performances with the Oklahoma City Philharmonic Orchestra and the Winston-Salem Symphony. The educational aspect of their music shines through at elementary school performances and library summer reading programs across America. Sugar Free Allstars is listed on the Oklahoma Arts Council’s Touring Roster as well as the Mid-America Arts Alliance’s Artist Registry.